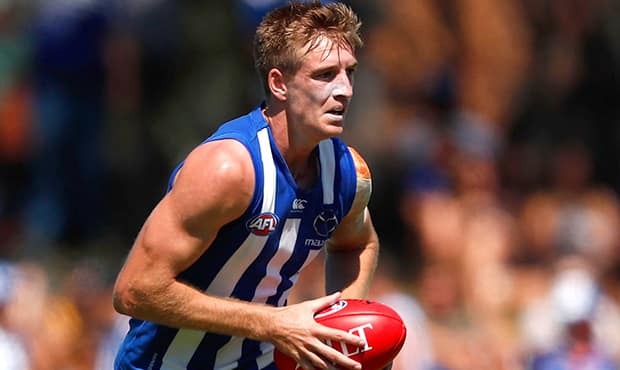 Key-defender Sam Durdin’s impressive start to his make-or-break 2017 season has earned him a two-year contract extension at North Melbourne. Durdin, pick No.16 in the 2014 NAB AFL Draft, told AFL.com.au he was under no illusions his career was on the line ahead of his third season at Arden Street, when he was due to come out of contract. "My first two years weren't overly great in terms of progression, but Brad (Scott) and I had a fairly honest chat in our exit meeting at the end of last year and just spoke about how important it was to get in the right shape for the 2017 season," Durdin said. "After that meeting I stayed in Melbourne over the off-season and worked with Ben Cunnington and our running coach. We just all stuck together and got a fair bit done, so I was able to come back in pretty good shape and have a good pre-season." Over the two-month off-season, Durdin trained three to four times a week with Cunnington, completing morning running sessions that ensured he reported for the start of pre-season training in November with a significantly improved aerobic base. Despite missing the rare chance to spend time with family and friends at home in South Australia, Durdin knew he had to put his football career first. "When your career is almost on the line you want to do anything you can to put the right foot forward," Durdin said. "It was a fairly easy decision as soon as Brad had an honest chat with me and said he expected more from me. "I had no hesitation in staying and trying to get the most out of myself. It was the last year of my contract and I hadn't played a game yet, so it was fairly important to start the season well. "I had to get a few games under my belt and just prove to Brad and the coaching staff why I should still be on the North Melbourne list." Durdin's improved fitness stood out in the Roos' match simulation over summer and earned him his first game in North colours in the JLT Community Series – he played the opening two games, against Sydney and Hawthorn – and, ultimately, his AFL debut in round three against Greater Western Sydney. Apart from some shaky moments early, the 20-year-old showed encouraging signs against the Giants, finishing with 10 possessions, one contested mark, three rebound 50s and four one-percenters. "I found it a much higher level from any type of footy I've played before in my life, especially the first half, just trying to adapt to the pace of the game and the bigger bodies took a bit to get used to," Durdin said. "But after that you get more comfortable and feel more involved in the game, so I took a fair bit out of it." 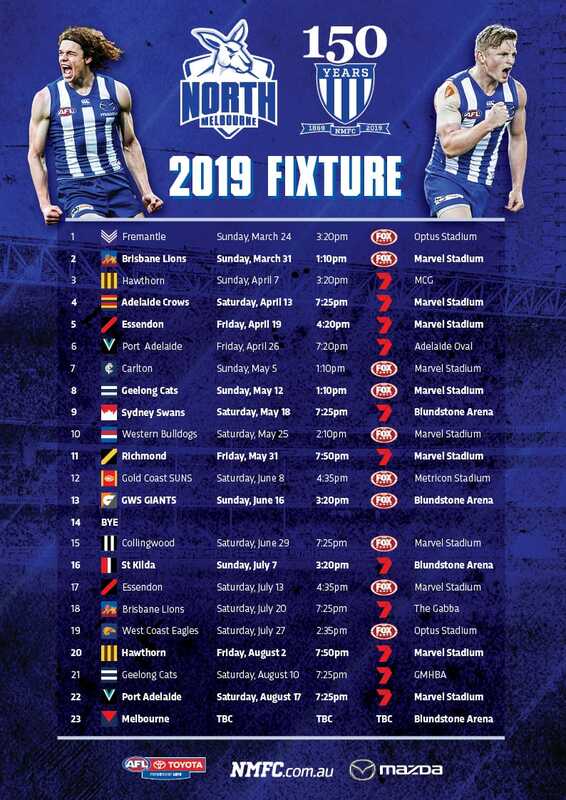 Durdin received his senior call-up after Scott Thompson was suspended for one week and the veteran defender replaced him in North’s round four team. Durdin wasn't "overly disappointed" to be dropped after one game, having received a largely positive review from North’s coaching team. He also knows he will be given every chance to break back into North's team this year and to cement a senior spot over the next two-and-a-half seasons, as the club continues the list regeneration it started at the end of last season. The opportunity at North and its exciting mix of experience and emerging young talent ensured Durdin had "no hesitation" recommitting until the end of 2019. His challenge now is to string together a consistent stretch of form that North’s selectors cannot ignore. "Scotty pulled me aside after my debut and said, 'Keep going in the VFL, keep your form up, play some good consistent footy and your opportunity will come'," Durdin said. "I'm just trying to do everything I can in the meantime to make sure I'm ready when my next opportunity comes."